Anatsui sends large artworks to museums and galleries without any instructions on how to hang them. This sometimes causes problems. El Anatsui is a man as unremarkable and exceptional as a bottle cap. He was born in a town next to the sea in Ghana, the youngest of 32 children. If you’re curious about why he wanted to become an artist, there’s no tragic backstory or inspirational tale to find here: he decided to study art in his teens for absolutely no reason except that he wanted to. He went to art school where he learned about all the western greats - Mondrian, Picasso, Bob Ross - and after graduating got a teaching job at the University of Nigeria where he’s stayed for almost thirty years. And that’s pretty much it for his backstory. El has an equally uninteresting demeanor to match. People that have met him will tell you: there is absolutely nothing remarkable about him in person: he’s just a quiet, white-haired professor that likes to play checkers in the evenings. The disconnect between his lackluster presence and his grand, shining, jewel-like sculptures is almost comical. Even the materials he chooses to work with - discarded objects like bottle caps - are boring. C’mon dude, liven things up a little bit! But that’s where El shines: in making the unremarkable remarkable. From the description we gave, it may be difficult to believe that El Anatsui's works are actually some of the most expensive in Africa today. His work is consistently ranked in the top 10 highest priced at every auction. His iconic bottle cap sculptures made to resemble woven kente cloths have been valued at as much as 1.5 million dollars! So he must be like super ballin’, but El doesn’t like to talk about money. For him, it’s all about the work: exploration of new and different materials, representing traditional Ghanaian beliefs and motifs, finding bottle caps in discarded trash bags alongside the road - this is his passion. That attitude is part of the magic formula that’s made El so successful, both in Africa and across the world. What we love most about him is how he’s stayed so humble and true to himself throughout his success. Who cares if he’s "boring"? 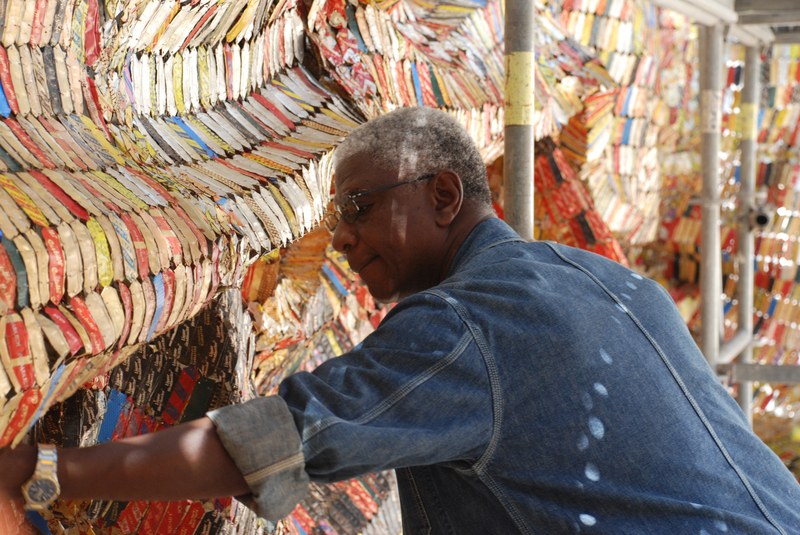 He doesn’t need all that fluff that other artists have: El Anatsui is the king of humility and chill. Sanchez, Dana. “Only 1 Female Ranks In Top 10 Highest-Selling Works By Nigerian Artists At Auction,” Moguldom, Mar 9 2016, Accessed Aug 2018, https://moguldom.com/120998/selling-art-in-nigeria/. Probably the world’s greatest and proudest scavenger-artist. He’s not Muslim, no matter his Arabic name. In fact, he was raised by a Christian. Anatsui was a kid when his mom died and got sent off to live with an uncle, a thoroughly European Presbyterian minister. Young Anatsui went off to art school about the time Ghana threw off colonial rule and guess what, the entire art school curriculum was European, as were most of the profs. I’m not saying that’s bad, but the irony! It is only when he started to teach art, in Ghana and then Nigeria, that it dawns on him how rich the local culture is and he becomes the art genius that he is today. Artworks, GAWU. Accessed 28 March 2014. Greg Cook, Dartmouth showcases sculptor who turns junk into precious metals, The Boston Globe, February 24, 2007. Lilian Diarra, Ten African Artists to Look Out for, The Guardian, 26 March 2014. Alexi Worth, El Anatsui, New York Times, 22 February 2009. El Anatsui [ah-nat-SOO-ee] (born 1944) is a Ghanaian sculptor active for much of his career in Nigeria. The youngest of 32 children El Anatsui lost his mother and was raised by his uncle. He looked for "something that had more relationship to me, as someone growing up in an African country". El Anatsui wanted to "draw connections between consumption, waste, and the environment". As he would say, "Art grows out of each particular situation, and I believe that artists are better off working with whatever their environment throws up". He has drawn particular international attention for his "bottle-top installations". These installations consist of thousands of aluminum pieces sourced from alcohol recycling stations and sewn together with copper wire, which are then transformed into metallic cloth-like wall sculptures. From such materials used which may seem stiff and sturdy are actually free and flexible which often helps with manipulation when installing his sculptures. Check out the full Wikipedia article about El Anatsui. Let’s have a party, we’ll all dance the Horah!